I needed some treats to take to a neighbor today, and wanted to try something fast and easy. So I whipped up these butterscotch bars. Oh man, are they ever good! They are moist and chewy and have a great butterscotch-y (is that a word?) flavor. I used pecans in mine and I thought it was perfect. I love using this nut chopper to chop my pecans. I store it in the fridge so I can have chopped nuts ready in seconds. Such a time saver! It was a good thing it makes a small batch or I might have eaten them until I was sick. They are definitely going into my recipe box of favorites! 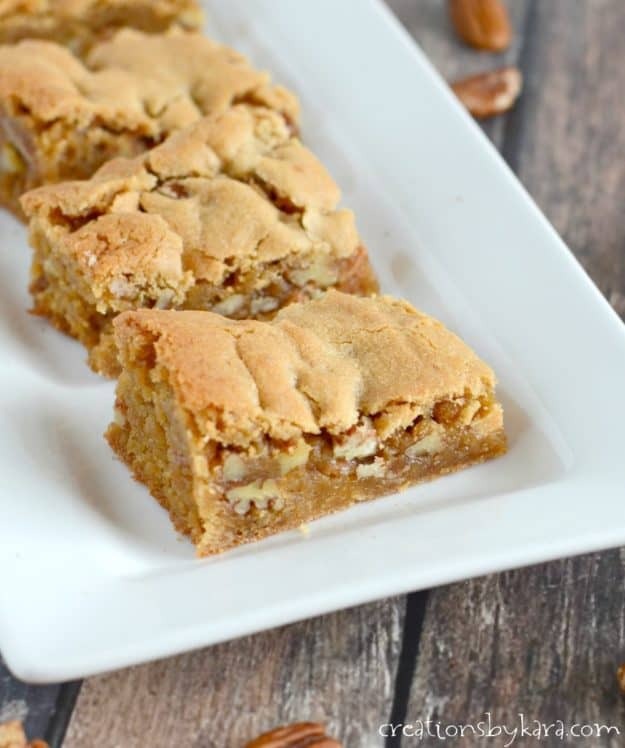 If you love a chewy blondie with a rich buttery flavor, you have got to give this recipe a try! Start with melted butter, that’s what makes the bars extra chewy. You will also be using all brown sugar, and that also contributes to the decadent flavor and chewiness of these bars. Cream the brown sugar, melted butter, and maple flavoring in a mixing bowl. Beat in the eggs. Stir in the dry ingredients and chopped nuts. Pour into a greased 9″ square pan. Bake at 350° for about 30 minutes or till toothpick comes out clean. Cool on a wire rack, then cut into bars. 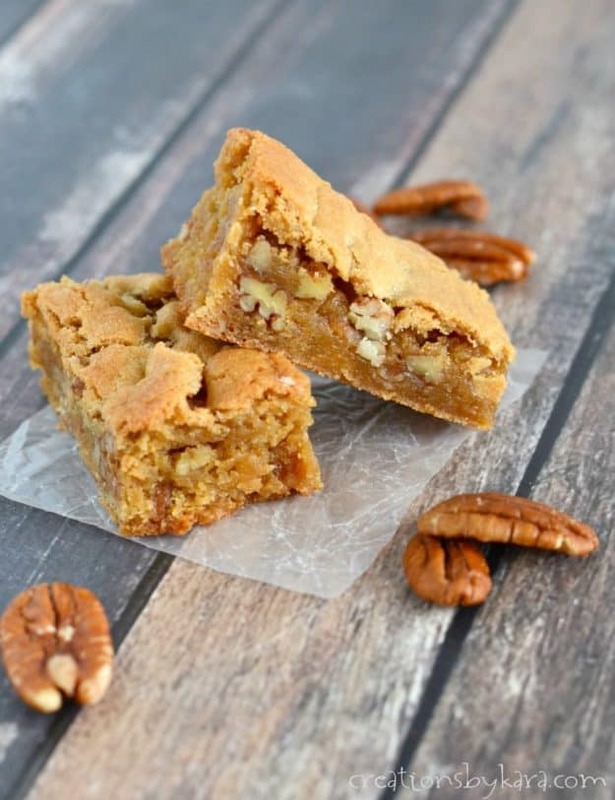 Rich and chewy butterscotch bars with pecans. Cream brown sugar, melted butter, and maple flavoring in a mixing bowl. Beat in the eggs. Stir in dry ingredients and nuts. Pour batter into a greased 9" square pan. These bars are pretty rich, so I cut them into smaller sized bars. Originally posted 10/20/2008. Updated November 2018. This is a great recipe! Thank u for sharing. I’m getting ready to host a party for 70 people. I would like to make these ( bake & freeze about a week ahead of time then let come to room temp ) & slice day of serving. Have you tried this? Or do you have another suggestion about freezing ? I haven’t frozen them before, but I think it would work just fine. I’d wrap them up really well in a few layers of plastic wrap, and put them in an airtight container if you have one large enough. Have fun at your party! Sorry, I didn’t weigh it so I’m not sure. 1 cup of flour is equal to 4 oz. Therefore, 1.5 cups would be 6 oz. weighed. I am craving these bars right now! Love the addition of pecans! These sound wonderful! And.. I also always put a Y at the end of words. Butterscotchy is totally a word. 🙂 Thanks for the recipe! 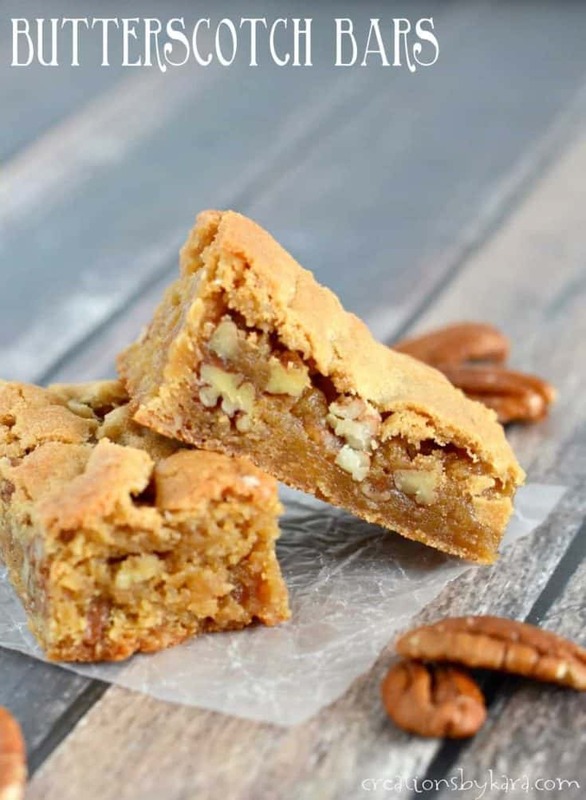 The maple flavoring and pecans makes these bars taste so good!!! These bars are so chewy and good! Butterscotch doesn’t get enough attention in desserts! I made these last night – delicious! Thanks for the great recipe! I served it as a dessert and added a small scoop of vanilla bean ice cream. Yum! Oh man, I bet they would be great with vanilla ice cream, especially if they were warm. 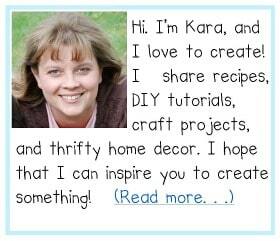 I’ll be trying that next time I make them! When you say 1/2 cup melted butter are you saying a 1/2 cup after its melted or 1/2 before melting. I’ve made a ton of recipes that call for melted butter but it does not measure the same when it comes to solid vs. melted. I would love to make these for my moms sweet tooth. I just take 1/2 cup (1 cube) of butter and then melt it. Hope your mom enjoys them! Hi, could the butter just be softened instead of melted when you cream it with the brown sugar? If it’s melted will it liquefy the sugar? Thanks. The melted butter is supposed to liquify the sugar a bit. That’s what gives these bars their chewy texture and makes them so good! What is maple “flavoring”? Can I use real maple syrup instead? Thanks.